I still can't believe today is the 1st of October-this year has flown by! Anyone else feel that way? Now that fall has arrived here in LA, my collection of ankle boots have been in heavy rotation. One of my new favorite pairs being these Sole Society booties they remind me of these Rag & Bone booties but for a fraction of the cost. I wore this out to breakfast this past weekend, while discovering a cute bagel shop around the corner from my new place. Even though I've lived in LA for a little over a month, I am still discovering so many new places. Any suggestions of places to try are highly encouraged! 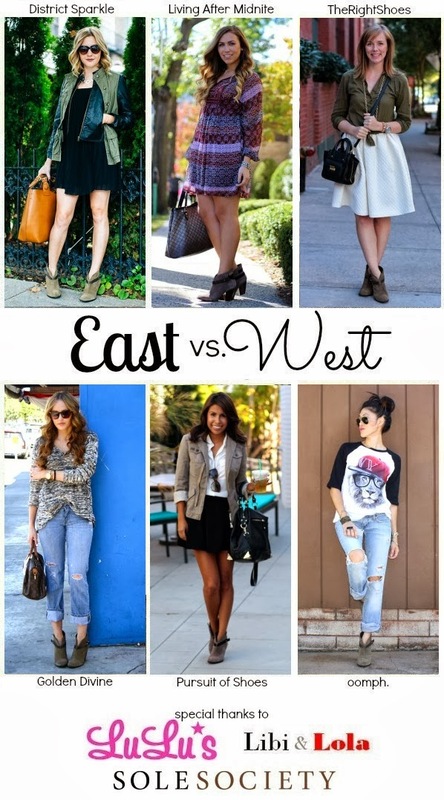 So excited to share another East vs. West style series featuring my most coveted ankle boots, that I haven't taken off since getting them in the mail. See how a few of my favorite bloggers style their ankle booties: Meaghan from District Sparkle, Jackie from Living After Midnite, Tracy from The Right Shoes, Ashley from Pursuit of Shoes and Beck from Rock Oomph. Love your look very much. Casual and cool at the same time! Pretty cool style. Love the sweater and the boots. Really loving this look. Very chic and fashionable.